It was raining as I entered North Carolina. The moment would have been jubilant had I not been wrapped in my poncho, slogging through the damp to stay warm. Inside I felt it, a small jump in my stomach, a bit of kindling added to the spark within that’s driving me north toward Maine. I stood at a spring in Bly Gap, just beyond the border, and asked another hiker how far it was to the next water. “Me neither,” I replied. “That’s why I’m asking.” I shrugged my shoulders with my arms in tight and kept on walking. A day later the clouds broke up and it felt like a real spring day; I was two days out of Franklin, N.C. There were rumors of rain that night, a rain turning to snow. It was hard to believe with everything so beautiful at present, but weather in these woods is turbulent and oscillates quickly. A tired, but happy hiker. Albert Mountain, N.C. It was the first day of spring and I was up over Albert and past the 100-mile mark, another big psychological boost. The view from the tower was broken to the north with gray storm clouds rolling in over the hills. The Long Branch Shelter was nearly empty when I got there, but the rain and the cold would drive hikers in as the evening turned cold. Rain, then hail, and then the wind whipping up and everyone wrapped tightly in their bags. 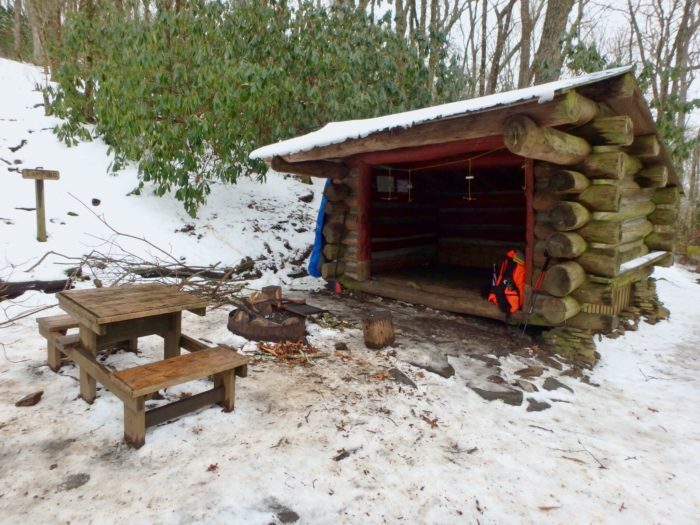 It started snowing late, a dusting that blew in toward the open shelter, covering anything left out and freezing socks solid. I would only later learn that this section of the AT caught the tail end of a nor’easter, and it threw a changeup for those out on trail. 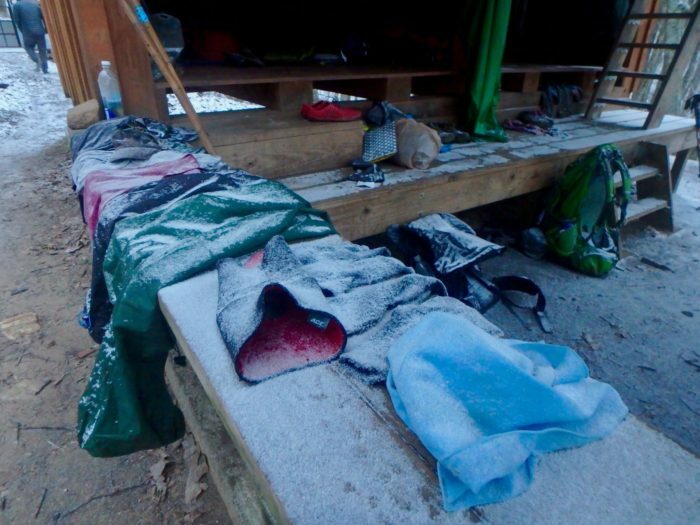 Clothes frozen solid with dusting of snow. 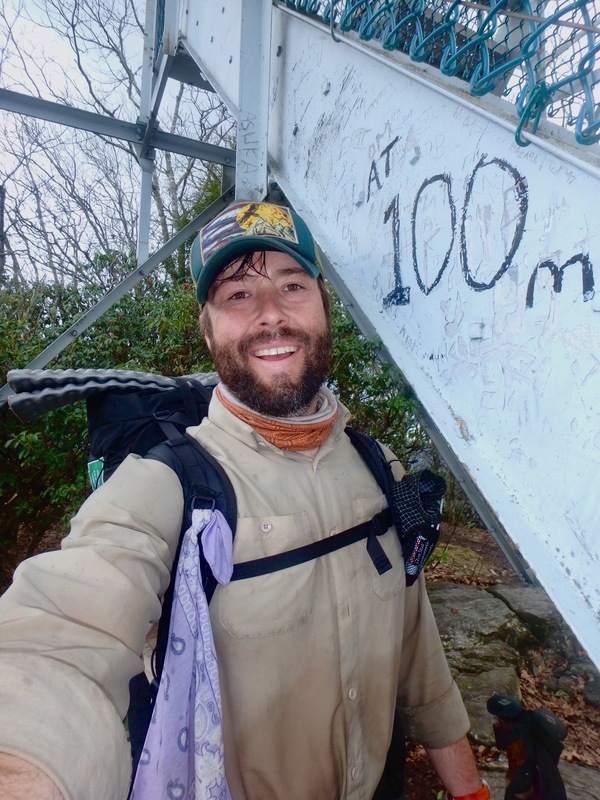 Long Branch Shelter, N.C.
With the cold weather and continuous trail pounding everyone has leg, joint, feet, back… basically aches and pains everywhere constantly. 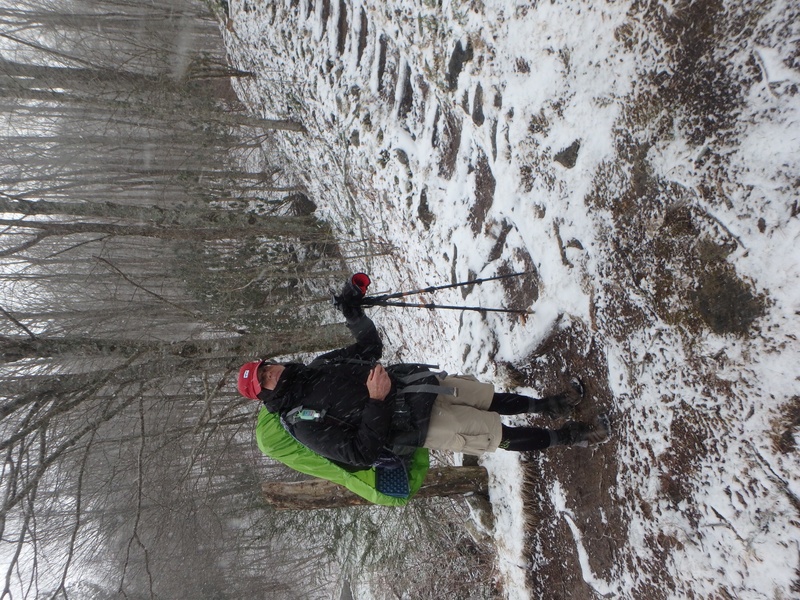 My remedy has been to push through it, which I know can lead to overuse and stress injuries, but standing at Winding Stair Gap, in the freezing cold, with the snow coming in, it was a consideration of mine to press on, as I initially planned to skip Franklin. Debating town stops vs. what’s ahead. No Service. 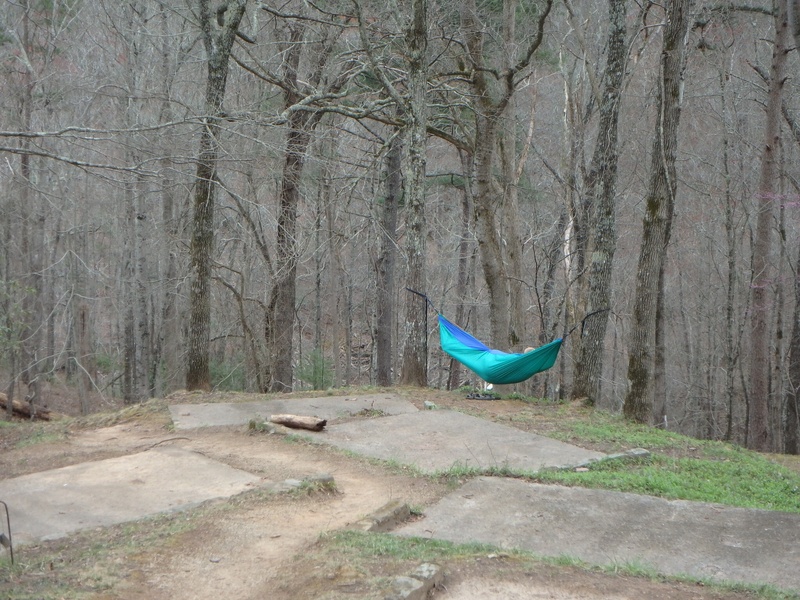 Winding Stair Gap, N.C. I stayed at Baltimore Jack’s hostel in the bunkroom. I talked with other hikers and strategized my resupply, ate free pancakes at the Baptist church, admired the confederate monument, and generally enjoyed my stay in Franklin, N.C.
Franklin actively tries to outperform all other towns, and if not on the entire AT, then certainly in North Carolina. This was my first zero day, a day when I do not hike any trail, rest up, and eat all the remaining junk food in my food bag despite knowing I really ought to eat a salad or something. I spent most of the first day watching the snow blow across the parking lot and listened to circulating rumors of hikers being bailed out off Wayah Bald due to whiteout conditions and feet of snow. From my vantage point near the dirt lot of the hostel, the snow wasn’t even sticking so it was difficult to imagine. Heading back to the trail, the sky was clear with ideal conditions and there appeared to be little lingering snow in the mountaintops. But the mountains from the road are very different from the vantage of being on trail. 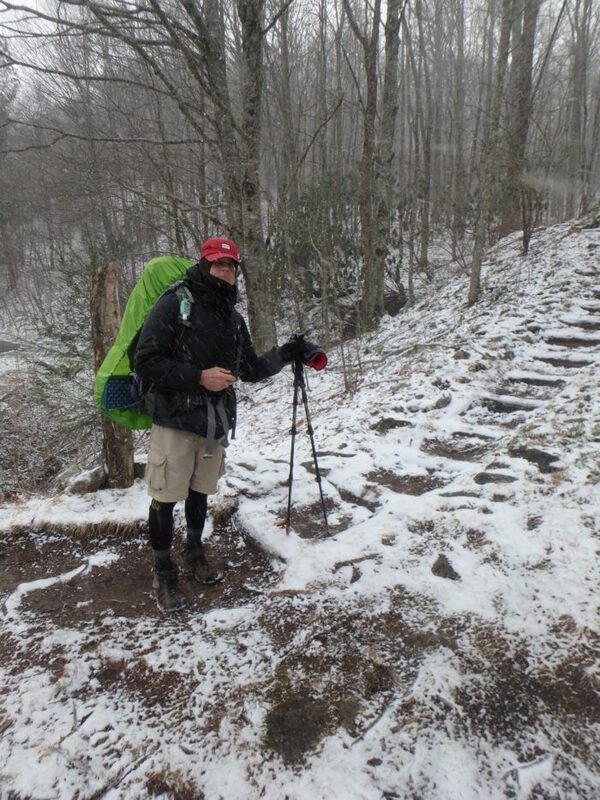 My hike out of Franklin epitomized the shoulder season unpredictability of the weather. It was a long slog through mud and snow, the snow compacted by boot prints into a 12-inch ice chute. I was grateful that I wasn’t the one out there a day ago breaking trail on some narrow sections that would be obscured and hard to follow. I later met the girl who spearheaded the trail break and she is now aptly called Snow Angel. Cold Spring Shelter, N.C. According to the guidebook, a CCC project from the 1930s. I passed up and over a few balds, Wayah the more spectacular for being caught in a brief moment of broken clouds, Weser socked in and windy, with the observation tower threatening to topple over. There were varied conditions that I could see validate circulating rumors for anyone caught in the thick of it. I weathered a thunderstorm outside the NOC, with my gear getting soaked and felling hopeless and claustrophobic inside my tarp and bivy combo. It worked well for the first couple weeks but the prospect of living out of a cramped and minimal setup was maddening in itself. I bought a new Big Agnes and sent the other stuff home to join the many other items inside the gear box. Not the type of money I was hoping to spend, but even after the first night I felt considerably better with the living space. I’ll let time on trail be the judge of the worthiness of the investment. 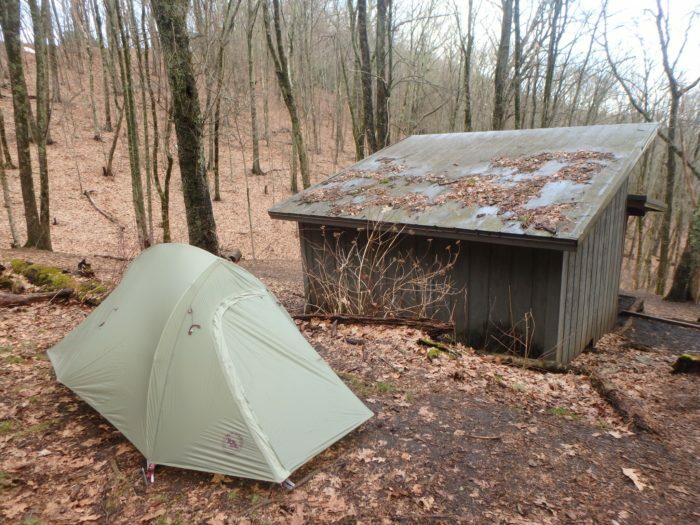 New tent outside Sassafras Gap Shelter, N.C. I found the NOC to be very relaxed place with a good gear shop and a small general store that sold what has to be the best ice cream sandwich I’ve ever eaten. There were plenty of places to kick it and loitering outside the shop and sitting on the ground with 12 pounds of junk food was just no big deal. There was a slalom-type river race in progress that weekend so in addition to the inbound hiker-trash, there were river bums and passing visitors. 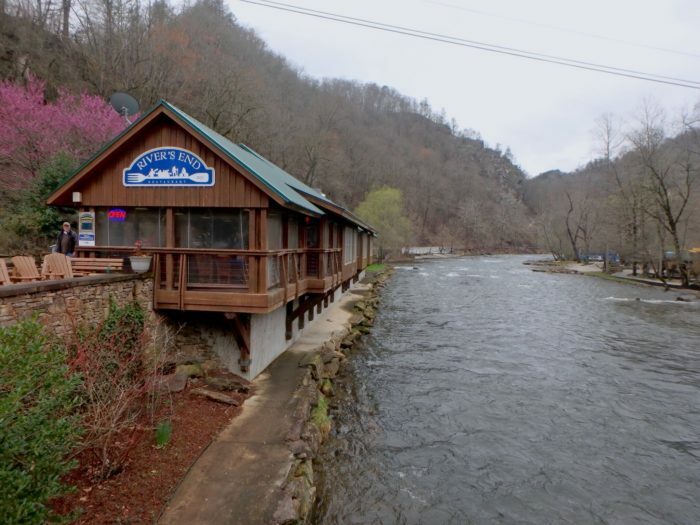 View past the restaurant on the river. NOC, N.C. There are some good stops and some bad stops. At the NOC I got everything I needed and left in good spirits. I wish every stop was that way. When I rolled into the Marina at Fontana, all I wanted was to pick up my mail box and do some laundry. 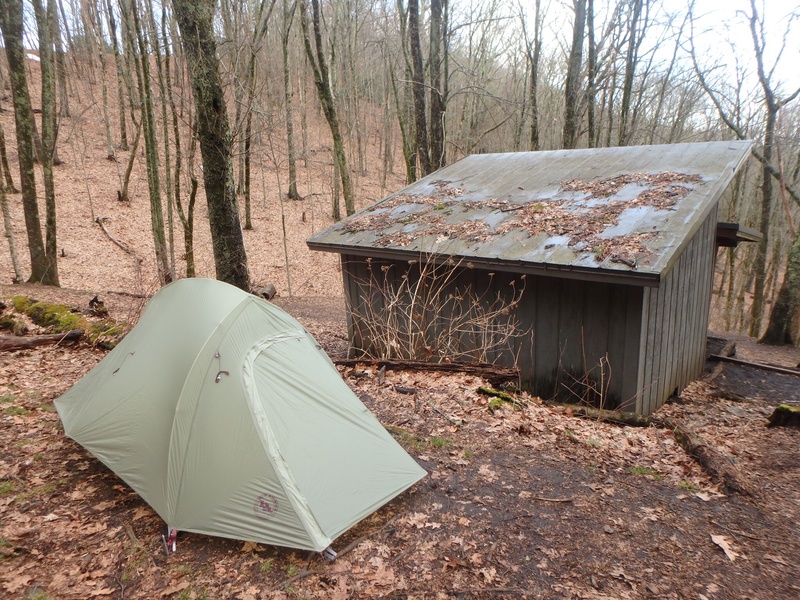 I camped not far out as I knew I’d be forced in with others throughout the Smokies and camped away on a ridge. I got in pretty early and caught a hitch within minutes. This was a big boost that would soon be deflated. The driver told me Fontana Village is like a TVA company town, with many of the amenities run by some third-party company. 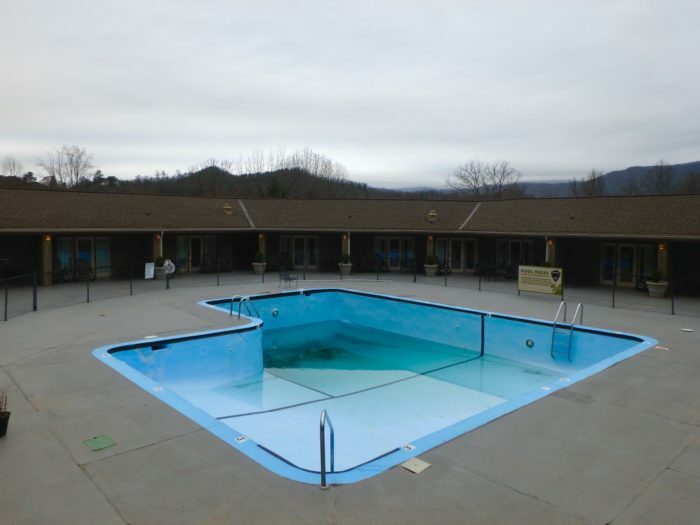 Empty swimming pool and ghost town like feel at Fontana Village, N.C. I am, admittedly still pretty early as far as AT thru-hikers are concerned, but Fontana Village seemed completely unprepared to host. Perhaps if you are more the blue jeans and white sneakers type, then this place will be right up your alley. I was immediately discouraged when I learned that only one of the five washing machines was operable and there was already a list of hikers waiting. This would extend my stay in the village far past what I desired. I got my box, sent some stuff home, and did my laundry in the sink at Fontana Hilton. The Fontana Dam Shelter is dubbed The Hilton because it’s about four times as large as the comparable shelters in North Carolina. This means four times the people, four times the burping, farting, rolling around on noisy sleep pads, four times the fidgeting and so on. There is an option to camp in the area on concretely slabs that used to be the foundations for picnic table and getting a tent staked into the concrete is a feat of innovation for the willing. Hammock over developed tent pads. Fontana Shelter, N.C. I guess the appeal is there is guaranteed to be a party as this is the most front-country type shelter up to this point. The village is a quick shuttle ride and folks are seen rolling in toting cases of natty-light. There’s also a flush toilet and a shower and a sink that doubles well as a washtub. The view over the lake is remarkable, and looking into Great Smoky Mountain National Park is exciting.